Alberta is getting two public transportation pilot projects that will connect Lethbridge and Medicine Hat, and Red Deer and Innisfail. Premier Rachel Notley announced the new routes in Medicine Hat Wednesday, saying they will complement four existing pilot projects in Camrose, Grande Prairie and Spirit River. The Lethbridge and Medicine Hat route will connect communities along Highway 3 with the two cities, and two routes in Red Deer will connect the city with Gasoline Alley on Highway 2, and with Innisfail, stopping in Springbrook and Penhold on the way. 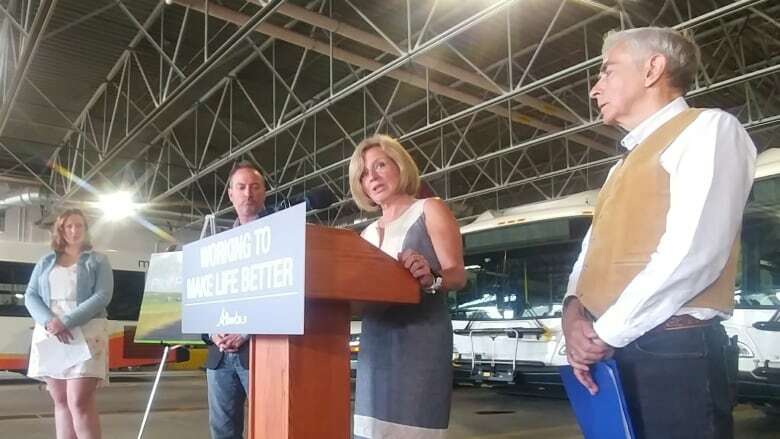 Notley said the Medicine Hat/Lethbridge route will provide 27,000 people with access to public transportation for the first time, the Red Deer routes will connect 11,000 residents, and that more than 200,000 people total live in the affected areas. Each route represents a $700,000 investment from the province for the municipalities to set up shuttle services. The funding will cover the full cost of the service for each community, the province says. The City of Medicine Hat is developing a request for proposals to contract out the pilot project that will include details about the planned service, the type of buses to be used and the anticipated fares. Red Deer County, which will set up the other new service, is also expected to contract it out, the province said. Both services are expected to be running by the end of this year. Notley said the decision to launch the additional pilot projects came after the news Greyhound was ending bus service in Western Canada, and through talks with communities across the province. "We heard one message loud and clear, that enhanced regional public transportation is a top priority," Notley said. Al Kemmere, president of Rural Municipalities of Alberta, commended the province on the new pilot projects and said he plans on riding the routes out to the different communities. "The thing that I love the most about the pilot project right now is that it's in four unique situations around the province … I think it's a great initiative," he said. Notley shared one example of the 16,000 students at Lethbridge College and Medicine Hat College. Of those, about 1,200 students have addresses outside of either city, Notley said. Beth Lewis of Medicine Hat College's student association said the routes will help students see their families more frequently. "The benefits of this shuttle go behind access to transportation as I sincerely believe it will improve the mental health of students who use it," Lewis said. Kemmere pointed out that Alberta isn't the only place in Canada that's struggling to connect remote, rural communities. Last week, Notley raised the issue of Greyhound's service cuts at the premiers' meeting in New Brunswick, where the premiers collectively called on the federal government to work with Greyhound and delay the planned cuts. "In Alberta, we have a vision of a future where all Albertans can have safe, affordable, accessible and environmentally sustainable transportation options, regardless of what it looks like. This new pilot program is one small but important first step as we work toward achieving this goal," said Notley.